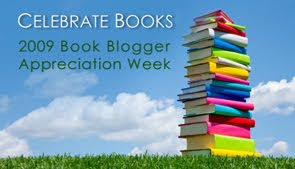 Today I'm lucky enough to participate in the Book Blogger Appreciation Week Blogger Interview Swap! That's a fancy way of saying today you get to read my interview with the lovely Jena of Muse Book Reviews. Jena and I were assigned the task of interviewing each other and (as was the idea) we'd never run across each other's blog before. We were both amazed by that fact as we have quite a lot in common, both in our background and in our reading taste, and I have to say it was a treat getting to know her and browse Muse Book Reviews. Without further ado, my interview with The Muse! How did you get started blogging and what was your goal when you started Muse Book Reviews? Several of my teacher friends asked me to keep them abreast of my reading when I left teaching. One night I decided a book blog was the best way to keep track of my reading and to share it with friends and family who were looking for book recommendations. Have you always been a reader or was there a specific book or series that really got you into reading? I’ve always been a reader, ever since Mom pulled us (I have two sisters) into her lap and read us books like The Big Orange Splot. I don’t remember the time before I learned to read, and I don’t remember a time when I didn’t carry a book with me wherever I went. You recently moved from the U.S. to Canada, with a VW van full of books. What prompted the move and how are you settling in? You mention on your blog that you and your husband met because you love books. Can you elaborate on how you met and how a love of reading brought you together? My husband found me through Bookcrossing. He contacted me because my profile mentioned that though I was an eighth grade English teacher, I was thinking about a career change; I felt more like an editor. He’s a writer, and his first contact with me was to ask whether I’d give him an honest opinion of his writing. He says my reply wasn’t exactly encouraging (there’s a gesture he shows when he’s telling this story), but he sent me a story he wrote, and I replied with my e-mail address. We e-mailed every now and then for the first year, and then we found ourselves online at the same time so we’d chat in Messenger a couple days a week. One night I called him just to see if he was real. We sent letters. We sent each other books and book recommendations. And when it became evident that I needed to meet him, I came to BC for a week after my first year of grad school. You read together every night—an incredibly romantic ritual, IMO. My husband and I often do the same! What have been your favorite books to read aloud together and how is the experience different from solitary reading? It is a lovely ritual, and my husband is a fantastic reader. (He’s often asked to read at spoken word events.) Because we only read a couple pages each night, it takes us a while to get through books, so we’re only working on our second book right now. The first was The Shipping News and we’re currently reading The Angel’s Game, which I wanted to read with him because he’s the person who recommended I read The Shadow of the Wind. I hope to read Harry Potter to him for the next selection (because it’s hardly fair that he gets to do all the reading). He wants to read Atlas Shrugged next, but I think I’d rather to read that one on my own. He edits a lot when he reads, which I don’t notice unless I’m trying to follow along (hard to do, near-sighted as I am). I noticed you display a Team Katniss button on your blog. What makes you Team Katniss and how do you feel about the whole Gale/Peeta debate? I’m a sucker for a teen love triangle. I have been since I was 12. And I really think I’d probably choose Peeta if we’d gotten to know Gale better in Catching Fire, but seeing as how we didn’t… I think it’s funny that people are choosing Gale, with as little as we know about him. I wouldn’t be surprised if Gale turns out to not be as wonderful as he might seem at this point in the story. From reading your blog I can tell you’re a Robin McKinley fan. As she is one of my all-time favorite authors, I’d love to hear about when you first encountered her books and which ones are your favorites? I don’t remember what my first McKinley book was. Possibly The Hero & the Crown. Possibly Beauty. I read The Hero & the Crown when I was student teaching, and about halfway through, it seemed really familiar, and five pages from the end, I realized that I had read it before—I’m just not sure when that was. But my all-time favorite book is Deerskin—and I don’t just mean my favorite McKinley book. You read and review quite a broad mix of genres, everything from literary fiction to fantasy and young adult novels. What draws you to such a variety and how do you decide which book to pick up next? I’ve often tried to figure out when I started to willingly read non-fiction. I have no idea. I just love a good story, and I love learning. I read YA books because I enjoyed them when I was a teen and even more as a teacher. As for choosing… Typically, I have half a dozen books I’ll get five or ten pages into before I decide which one will be the next one I finish. What do you do when you hit a reading slump and nothing you pick up seems to do the trick? I take a break. I turn off the TV. I write. Sometimes if I’ve been reading a lot of fantasy, I’ll try non-fiction. A good, quick YA book can work wonders in a slump. Usually, the problem isn’t that I don’t want to read or can’t find something good but that I’m too distracted by my environment or life to settle into someone else’s words. Thank you so much, Jena! And as part of the swap, you can find me over at Jena's place today answering her questions. Make sure to stop in to say hi and check out the awesome Muse Book Reviews! I love the story of how her and her husband met...and a VW full of books moving from US to Canada! Great interview. Thanks, Serena! It's a great story, isn't it? Great interview! Now onto yours! Charlotte, I'm glad you enjoyed it. I was very happy to be introduced to Jena and her blog. Liza, *grin* thanks for stopping in! Great interview and a new blog for me to check out! *claps hands* I really love the idea of reading a book with the hubby at night. I'm going to try that and see if I can convert him to a book lover. Jena, anytime! I just shook my head at our families descending at the same time. What are the odds?! Tiah, *grin* yay for new blogs. Good luck with hubby. You can do it! Yet another blog for my reader - excellent interview! You know, I've yet to read The Hunger Games, though it is sitting on my bookshelf. I *think* I have remained relatively un-spoiled so far, but I should really get a move on. Li, happy to add to your reader! And well done you on remaining unscathed by Hunger Games spoilers. Quite the feat. I love the story of how they met. And how they read in bed together! I wish my husband did that with me. Natasha, I agree. Great story and very romantic.